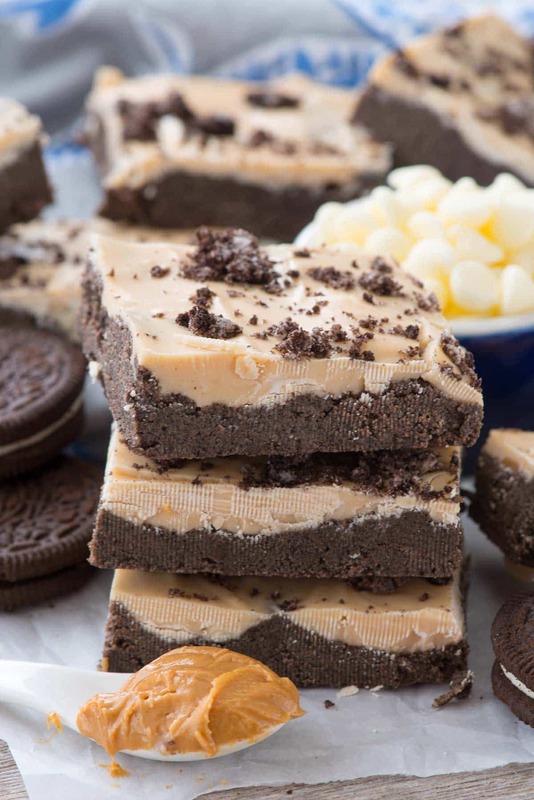 No Bake Oreo Peanut Butter Bars – this easy no bake peanut butter bar recipe uses OREOS instead of crackers! It’s chocolate and peanut butter at its best! Before we get into talking about how fabulous these no bake OREO peanut butter bars are, I have an announcement to make…drumroll…I started a TRAVEL section on the blog! That’s right…it’s Crazy for Crust TRAVEL, a blog all about delicious adventures. If you’re on my actual site, you can see the tab up at the top that says travel to always locate the site. This section has been a long time coming. I’ve been posting about travel here on this blog for awhile but I decided I wanted to do something a little more official. Plus, Mel is going to help me; he travels a lot for work so he can bring a business perspective to our reviews. Our plan is to cover everything from a family and business perspective, from hotels to restaurants, to fun things to do. If you’re interested in hearing all about our adventures, sign up for our email list here. It’s just one email a week with a digest of everything I’ve posted! In the meantime, I’ll continue making all sorts of goodies for you like normal. 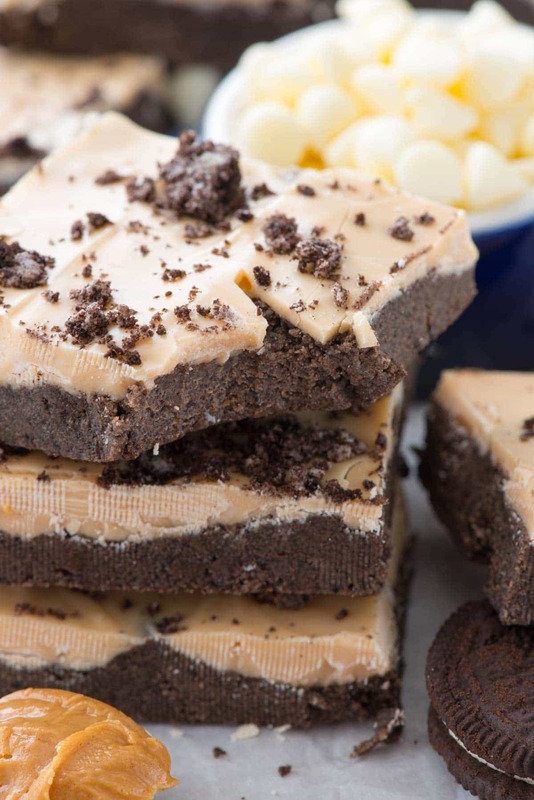 Starting with today’s gem: No Bake Oreo Peanut Butter Bars! 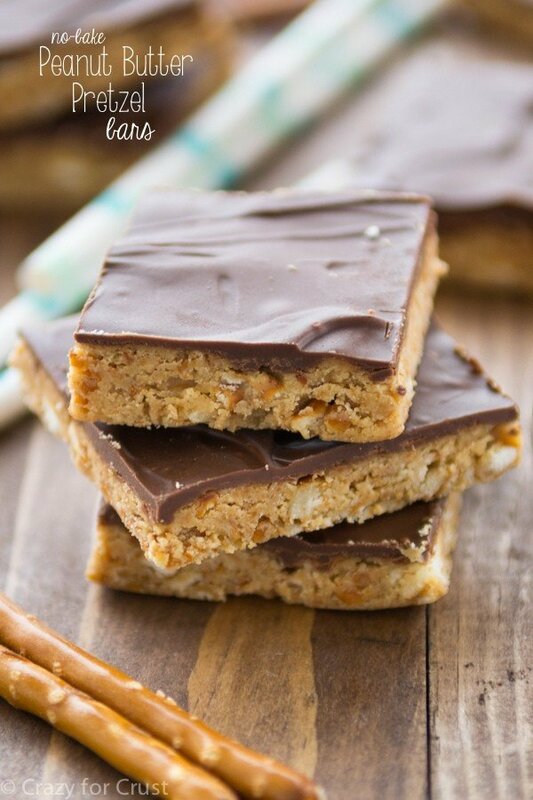 Do you remember my Double Peanut Butter No Bake Bars? 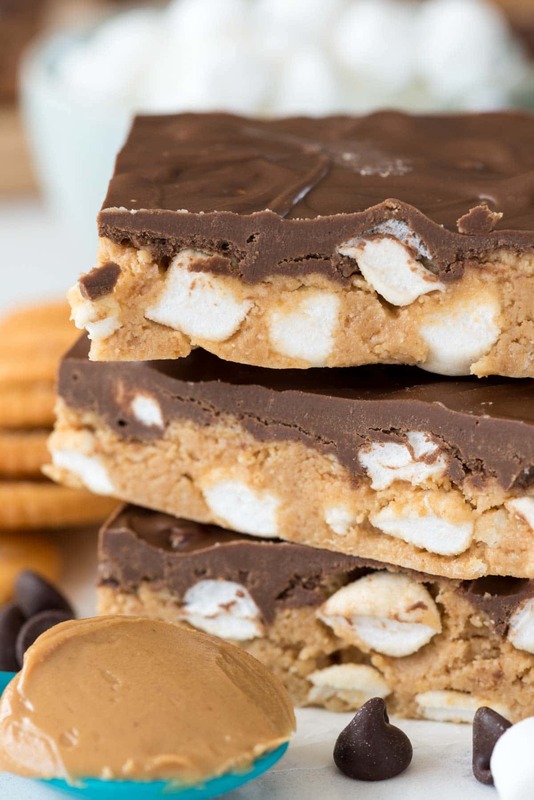 Or the s’mores version? Or the one with pretzels? Heck, I even have a lighter and skinnier version. Those are all pretty much the same recipe with a different cracker (graham vs. Ritz vs. pretzels). This is basically the same idea, but I used OREOS instead of graham crackers. 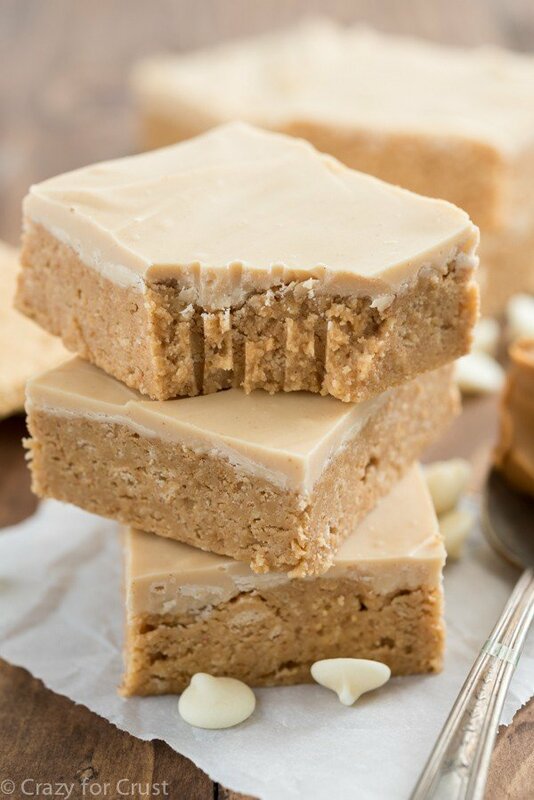 No bake peanut butter bars are always requested the most at parties and they always do so well on social media, so I was trying to think of a way to do another version that wasn’t just the same recipe with different color candy (ahem: cookie cake). That’s when I thought about using Oreos. I was a little doubtful if it would work…I knew it would taste good, but I was worried it would be so sweet it would make my teeth crumble and fall out. But I adjusted the amount of butter and powdered sugar and oh my goodness y’all…genius. 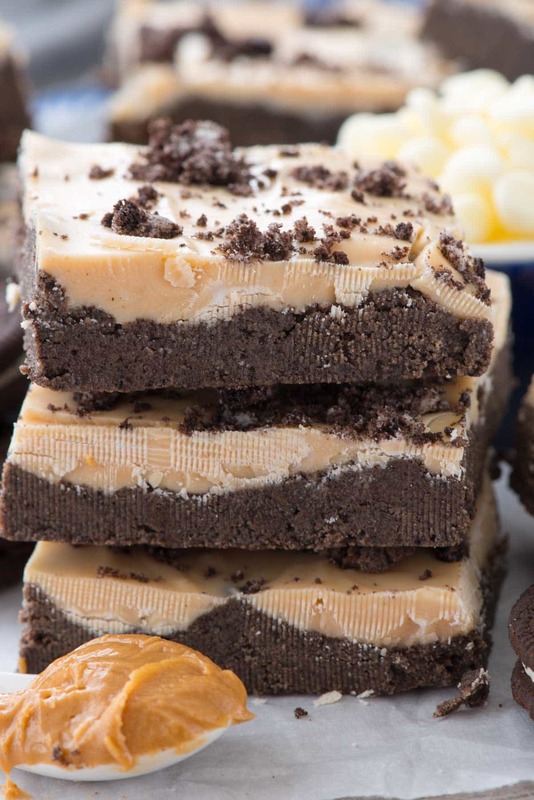 There are just a few ingredients needed to make this no bake Oreo peanut butter bars recipe: Oreos, peanut butter, butter, powdered sugar, and white chocolate. That’s it! I used my food processor because I find it’s easier to crumble Oreos using the food processor, but you can do it by hand or with a strong blender if you don’t have one. Basically you mix it all together and then let it harden in the fridge. The hardest thing about this recipe is not eating it all before you even have a chance to share them. This was definitely a “get it out of the house” recipe, and the friends I gave them to raved about them. How can you go wrong with peanut butter and Oreos? Hint: You can’t!! 🙂 That’s why there are recipes for things like peanut butter cup Oreo milkshakes and Oreo peanut butter dip. No Bake Oreo Peanut Butter Bars - this easy no bake peanut butter bar recipe uses OREOS instead of crackers! It's chocolate and peanut butter amazingness! Line an 8x8" or 9x9" pan with foil and spray with nonstick cooking spray. Place Oreo cookies in a food processor and pulse until roughly chopped. Reserve about 2 tablespoons of the cookie crumbs. Add the melted butter and blend until smooth, then add the powdered sugar and 3/4 cup peanut butter. Blend until thick. Press into prepared pan. Place 2 tablespoons peanut butter and white chocolate chips in a microwave safe bowl. Heat on 50% power in 30 second increments, stirring between each, until melted and smooth. Spread over the mixture in the pan in an even layer and sprinkle with the reserved cookie crumbs. Chill until set. For clean cuts, let the cold pan sit at room temperature for about 10 minutes and heat your knife under hot water. Use swift strokes when cutting and you'll avoid cracking the top too much. Store in an airtight container for up to 4 days. Yum, these sound divine! Wish I had some now. These bars need to happen soon! We can’t resist the chocolate pb combo! The fact that they’re no bake and super easy could make them dangerous! These look so yummy! I definitely need to try this recipe:-) On another note, as a failry amateur baker, could someone give me a tip whether cocoa or a cocoa/melted chocolate combo (or just chocolate?) make the most fudgy, dense brownies? Thanks in advance! Thank you! I’ve just moved from my favorite bakery, which made the fudgiest, most dense brownies and now I’m on a mission to replicate them:-) Both of those recipes look divine! I love the idea of adding chocolate chips to the top of the second one! Looks so great! I have a sweet tooth these days, gonna try it! Thank you for the recipe!